Attend for Your Chance to Win One of Two Flat Screen LED TVs & More! NEW MEETING DATE & LOCATION! As the market continues to get hotter and hotter, more investors are jumping in to take advantage of the trend. Some will be successful investors and others will not. That’s just the reality of the business. Many are not successful because they don’t have the proper resources. Many are not successful because they don’t have the proper training or guidance. Many are not successful because they don’t have the right plan and/or exit strategy. What’s your plan and/or exit strategy for your real estate investment business? Is it buying and holding? Is it wholesaling? Is it fixing and flipping? 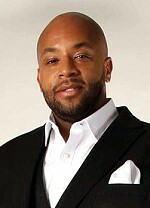 All three are very good strategies when the’re used properly, but there is a “myth” that wholesaling is the best way to start investing… but this month’s speaker, Ramon Tookes, strongly disagrees! 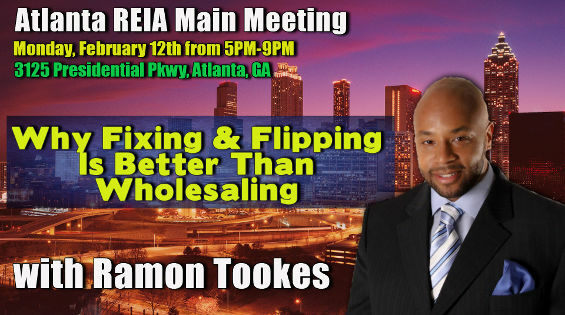 Please RSVP and join us at the Atlanta REIA Main Monthly Meeting on Monday, February 12th starting from 5:00PM to 9:00PM at 3125 Presidential Pkwy, Atlanta, GA, and Ramon will show you why “Fixing and Flipping” is much better than wholesaling. If you don’t belive it, come out and see Ramon and he will show you why he strongly belives this is true and why you should too. Why Most people feel like Fixing and Flipping is too risky… They ARE WRONG! How Fix & Flips allows you to work on a smaller number of properties and make more profit per year. Mark your calendar because all this is happening on Monday, February 12th at the Atlanta REIA Main Monthly Event. RSVP NOW & DON”T MISS IT! In any business, having customers come through your door, calling you and placing orders on the phone, visiting and ordering from your website, is what put dollars in your business. How did all that happen? Marketing, of course! How do you market if you are looking to buy a house or sell one? What types of marketing can you do? How do you stretch those dollars set aside for marketing purposes so you can get the best “bang for your buck”? 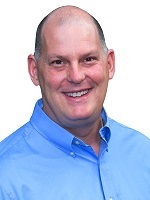 There is no one better to teach you how to get your marketing together other than Don DeRosa. If you have the drive and desire to make 2018 your best year ever, then join us at the Meeting Before The Meeting at 5PM. All attendees who check in and attend the Atlanta REIA Meeting will be entered be into a drawing for a chance to win several Flat Screen LED TVs, a variety of Gift Cards (such as Home Depot, Lowes, Walmart, Amazon, etc), Flashlights, Phone Chargers and all sorts of other miscellaneous items that vary from meeting to meeting each month. *You must be present and in the room during the drawing to win. Door prizes and giveaways can change at any time for any reason. Vendors are not eligible to win.